AVS Media Group provides a wide range of media services in the Southeast US. From a complete HD Mobile Production Unit to Single Camera Crews we can fulfill your media requirements. With over 30 years of media experience, we are continually updating our services and equipment to meet the needs of an ever changing national marketplace. HD MOBILE PRODUCTION UNIT READY FOR YOUR EVENT! If you need a complete portable HD shooting solution, AVS Media Group can provide it. Please call or email for details and a quote! 2 Day Live Broadcast of the Blue Marlin Gulf Coast Classic in Orange Beach at the Wharf for 3LD Media. AVS Media Group provided the crew and a HD equipment package for 3 days to uplink LIVE interviews to the NFL Network for the Senior Bowl. AVS provided camera crew and equipment for a live uplink in Mobile, AL announcing the $5 million dollar donation from Wal-Mart to the American Red Cross. 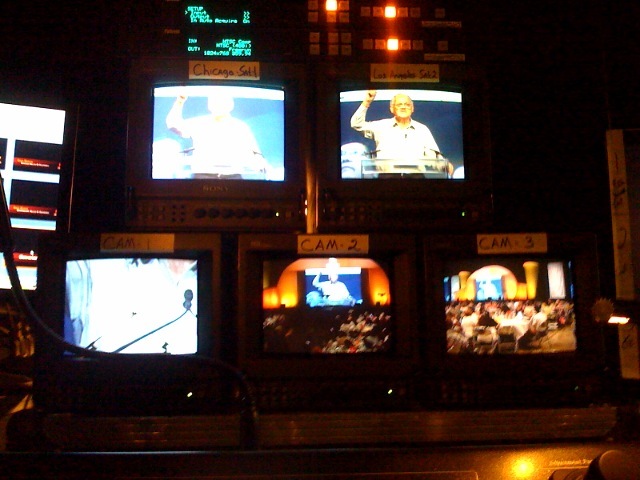 AVS Media Group provided a Director to switch the Satellite, Imag and graphic feeds for a 3 city Live Interactive Uplink / Downlink conference between LA, CA, Chicago, IL, and Birmingham, AL. The client was The Allstar Group / Mark Lovelace from San Diego, CA. AVS Media Group worked with Shamea Sound in upgrading and relocating the Production Department for The Voice Network. After the upgrade, AVS provided the Director and Floor Director for their 1st Telethon. Great group of people and staff! Copyright AVS Media Group. All rights reserved.